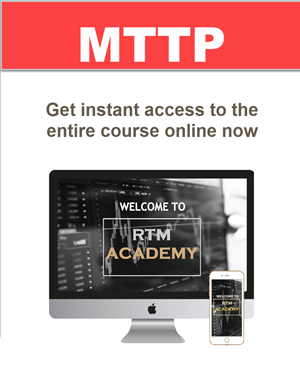 RTM Academy Master Traders Training Program (MTTP) is designed for New Students Only. It is for serious traders who are willing to roll up their sleeves, work hard, and put on their analytic hats to learn and master REAL price action and how to read the market from the lens of the Insitutional Traders, who are the people that move the market. Once you graduate from the Academy, you essentially know all there is about tthe market and have earned what is considered to be a PhD in market analysis. We are very selective in accepting new students to RTM Academy. You must pass the applicant questionnaire and the review process to ensure a seat in the Academy.